Richard Branson has officially declared that the Virgin Galactic Gateway to Space (previously known as the Spaceport America) is open for business in the New Mexico desert. Spacemen, rev your engines. 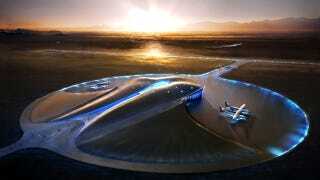 The extremely fancy $210 million hub for all of Virgin's Galactic enterprises is finished and ready for action. 450 of the first 2.5 hour flights, which offer five minutes of weightlessness and promise 'views of earth only seen by astronauts', have been sold for $200,000 each. Let's hope they release that list of 450 space-bound earthlings soon, yes? For the sake of the gold-diggers, you understand.